The candidates are selected by a written exam. 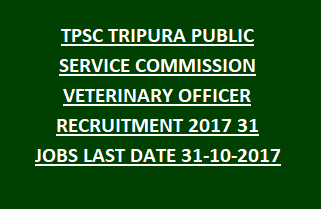 The candidates should apply for a veterinary officer by offline process.Along with applications form the candidates should upload the required documents. The application form is printed in color font will be available in all branches/extensions counters of Tripura Gramin bank. For receiving application form deposit the fee in the account num 14711 in the favor of secretary TPSC.